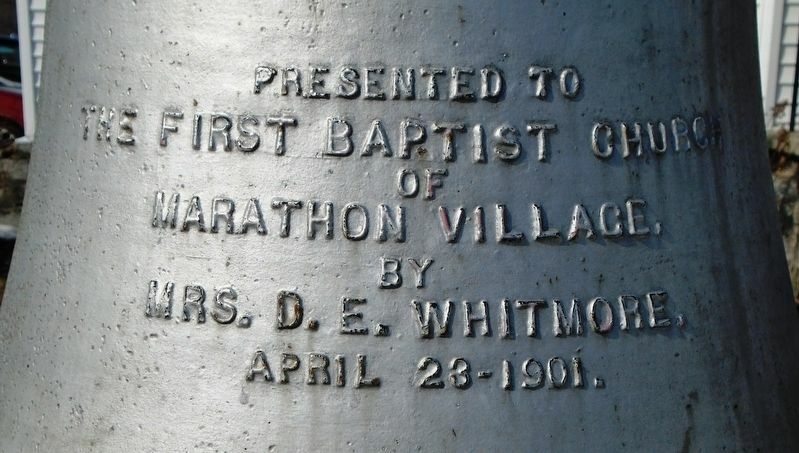 First Baptist Church Bell. —. Erected 1901 by Mrs. D. E. Whitmore. Location. 42° 26.489′ N, 76° 2.017′ W. Marker is in Marathon, New York, in Cortland County. Marker is on Main Street (New York State Route 221) west of Cortland Street/Broome Street (U.S. 11), on the right when traveling west. Touch for map. 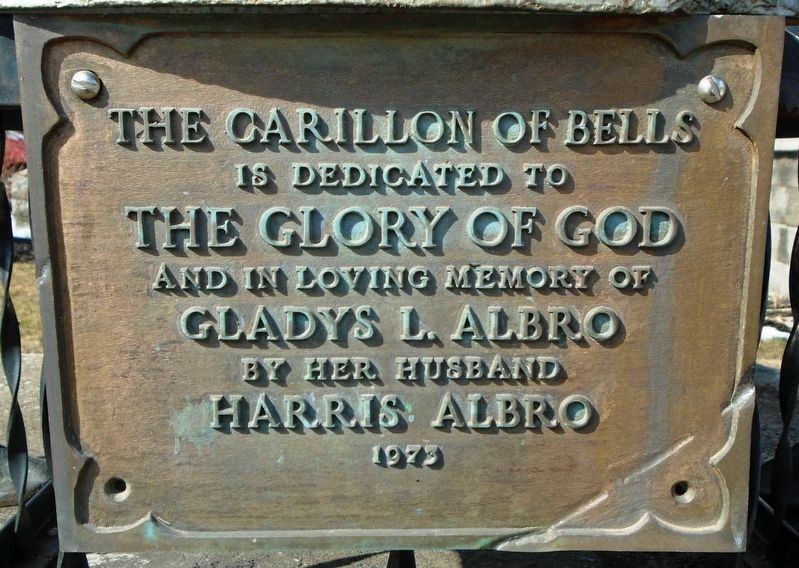 Marker and bell are on the First Baptist Church grounds. Marker is at or near this postal address: 5 Park Street, Marathon NY 13803, United States of America. Touch for directions. (within shouting distance of this marker); Peck Library (within shouting distance of this marker); Flag Pole (within shouting distance of this marker); A.C. Baker & Son (within shouting distance of this marker); Hulbert's Block (about 300 feet away, measured in a direct line). Touch for a list and map of all markers in Marathon. More. 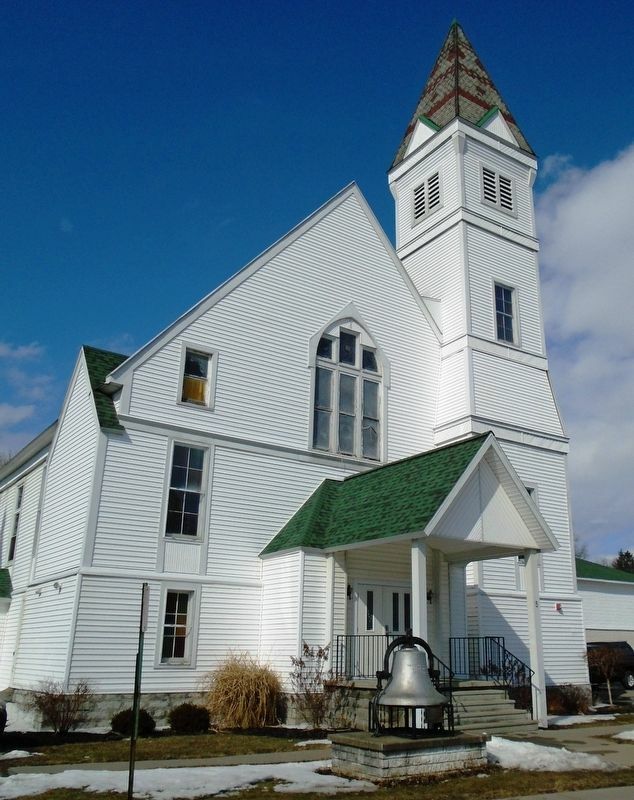 Search the internet for First Baptist Church Bell. Credits. This page was last revised on March 11, 2019. This page originally submitted on March 11, 2019, by William Fischer, Jr. of Scranton, Pennsylvania. This page has been viewed 40 times since then. Photos: 1, 2, 3. submitted on March 11, 2019, by William Fischer, Jr. of Scranton, Pennsylvania.